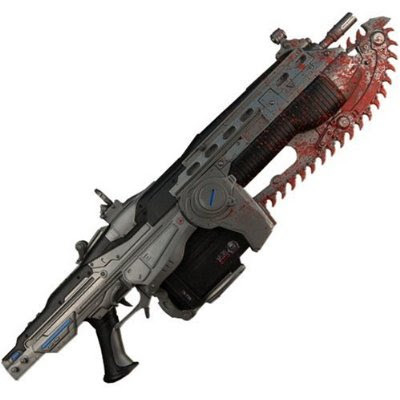 The Amazon.com exclusive Gears of War 2 Lancer. Full-sized replica of the workhorse weapon used by Marcus Fenix and the Delta Squad, right down to the bloodied chainsaw bayonet. Squeeze the trigger to activate the chainsaw sound effects and vibrating action. It also features a removable clip. Retail price: $139.99 and that isn't stopping it from currently being the #1 video game item at Amazon.